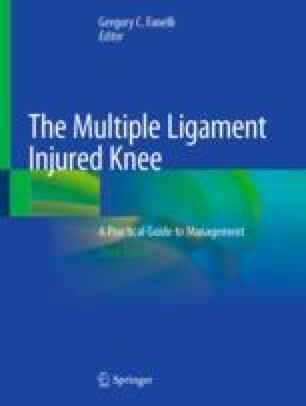 Multi-ligament knee injuries (MLKIs) are an uncommon orthopaedic diagnosis with a high rate of neurovascular injuries and limb-threatening complications. Accordingly, a prompt, accurate and thorough physical exam is essential to identify any possible complications early and guide management accordingly. AP and lateral radiographs, combined with MRI are often identified as the gold-standard imaging for assessing potential knee dislocations and MLKIs, however, CT scans, vascular studies and specialty radiographs all have a role in the acute and chronic evaluation of an MLKI. In the initial setting, external fixation is a reliable method for stabilizing and protecting the knee joint in cases of open dislocation, vascular reconstruction or a grossly unstable reduction that cannot be maintained with a knee immobilizer. Definitive surgical management of MLKIs has the goal of providing a functional, pain-free and stable knee. The current controversies pertaining to surgical treatment include: early versus delayed management, arthroscopic versus open cruciate surgery, single- versus double-bundle cruciate reconstruction and transtibial versus tibia inlay posterior cruciate ligament reconstruction. Each of these controversies is explored within this chapter, with the presentation of the current evidence on either side of the debate. Knowledge of the basic principles surrounding initial and definitive management of knee dislocations, and MLKIs, aids the treating surgeon in managing these complex injuries.